have a set routine that they do every day that is not flattering…yet they don’t know it’s not flattering! Often, women will be attached to a liquid liner, or some kind of frosty shadow combination that they apply every day without fail, and have no idea how to break the cycle – or that they even need to break the cycle! At one point or another, many women had a department store makeover. Usually, the amount of colors used during this makeover – and inability of the salesperson to teach them how to duplicate the look at home – results in a half-baked makeover attempt that is utterly lacking, yet still becomes a woman’s routine for the next 10 years. I am shocked that most women who apply lots of shadow seem to think it looks good, when more often than not, it actually makes them look worse. This, in my opinion, is why most men don’t like makeup. They see so many women applying makeup heavy-handedly in all the wrong places, using all the wrong colors and all the wrong tools. I always wonder why no one tells these women that their makeup is wrong and making them look older and/or desperate and/or or cheap. Especially older women, who seem to be especially stuck in their ways and don’t know who to trust to help them update their look. One of the biggest obstacles is that there are waaaay too many options out there, leaving a lot of room for error. If you go into a store, you have to trust the salesperson that is picking the colors for you. I am shocked when I walk through the enormous makeup department at Bergdorf Goodman and see so many salespeople, who badly need makeovers themselves, giving makeovers to customers! Who do you trust? If you do get lucky and have a talented makeup artist doing your makeover, you are then faced with a multitude of colors, brushes, not to mention a huge bill, if you have the courage to attempt the look yourself at home. Maybe you spring for just one of the shadows, or just the liner. Then when applying the makeup at home, you wish you had spent the money on all the products because you loved looking that good and feel hopeless that you’ll ever be able to recreate the look yourself. It is with these issues in mind that I created my Paint by Numbers Eyeshadow Kit. This eyeshadow kit comes with a makeup palette containing 6 shadows, all numbered 1, 2, or 3. There’s a row for daytime and a row for night. It also comes with 3 brushes, also numbered 1, 2, and 3, and a foolproof diagram showing you exactly where each color goes. I have created the perfect base, crease, and liner colors that work on all skin types, tones and eye colors. My client’s loyalty, rave reviews and amazing looking eyes prove the concept works. It is so important that a base color not be too light, too dark, too pink or too peach. You want it to be the perfect base to make the eye open and pop, without making lids look wrinkled. The crease colors I created are more like blush colors, kind of a soft champagne bronze that opens the eye but doesn’t distract from your natural beauty. The shadow liners I created also compliment all eye colors, work with anything in your wardrobe and make you look younger and more vibrant. I sold these same shadows separately for years before creating the kit, and every woman I put them on would buy them. I would always draw the diagram, and write exactly which brush to use. A lot of times they would say they already had brushes, but if they didn’t buy them from me would more often than not come back and say it just doesn’t look the same as when I did it. I decided to include everything in one eyeshadow kit: diagram, shadows and brushes to simplify the process and make it easy and fun. The whole eyeshadow application should take a couple minutes, tops! My clients come back and tell me this is the first time they have ever had their makeup done and been able to recreate the look at home. Plus, the kit is great for travel! Everyone gets tired of fishing each color out of her makeup bag, opening and closing all the lids, and digging out the right brushes. This little book-shaped eyeshadow kit opens up with everything neat and organized. My clients love being able to throw out all their old colors. The Paint By Numbers Eyeshadow Kit is also truly multi-generational. My best friend who is in her 40s uses it along with her 15 year old daughter and 65 year old mom. And they all have different hair and eye colors! What better way to bond with your daughter or mom than sharing your newest beauty secrets?! 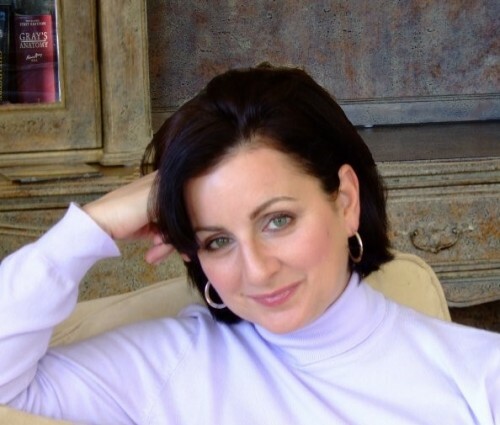 Here’s part 2 of our interview with inspiring female beauty entrepreneur, Brenda Christian. (Be sure to read part 1.) Here she shares some of her best brow tips that she’s learned in her 30+ year career. What step should eyebrow shaping be in your makeup routine? Brow clean-up, such as major tweezing or waxing, should be done prior to applying any makeup, so you are working on clean skin. For your daily routine, eyebrows should be applied in the middle, after the application of skin treatment, foundation, concealers, and eye primer. Brush the brows upward, clean-up any stray hairs with a good pair of tweezers, sharpen and apply Universal Brow Definer® and set by pressing on Perfect Brow Gel®. It always concerns me when I see a professional makeup artist tell someone that there is an absolute rule for applying eyebrows, because the truth is there is not. There are so many variables which must be taken into account, such as ethnicity, natural and/or enhanced hair color, size of the eyes, both horizontally and vertically, amount of lid above the eye and skin in the brow bone area, width of the nose and the nostrils and overall bone structure of the client. The two most important considerations are balancing the face and framing the eyes. The eyebrow is like a frame on a fine painting in your living room. One must take into account the color of the wall, the amount of space around the frame and the size of the piece of art. The overall goal is to add beauty to the room by framing the art. A beautiful room (the face) is the primary objective, and the art (the eyes) should enhance the room. If the wall is large and the art is small and a heavy, ornate frame is chosen, then the focus becomes the frame…not the room, not the art. So it is with eyebrow design. The goal is to create the most beautiful face, drawing attention to the eyes by softly and specifically framing them, keeping in mind the balance of the face so that a brow appears to be almost non-existent, youthful, and above all, natural. This isn’t to say that fashion trends do not play a part in the eyebrow design dynamic. Today’s brow is fuller, soft in relation to the hair color of the client, and carefully stroked with a precision wedge or point simulating real eyebrow hairs. Always work with a very sharp pencil, never a soft, crayon like pencil. The texture of the pencil is very important because it must allow you to create the width of an actual hair. Apply the Universal Brow Definer® in short, firm strokes, always in the direction the hair would grow naturally. This automatically gives a wider look to the root area of the brow stroke, narrowing toward the end of the hair, just as natural eyebrow hairs appear. The natural texture of the brow is achieved by applying Perfect Brow Gel® in short, pressing strokes, releasing a matte gel over the pencil strokes to set and enhance the brow application. As far as color is concerned, very rarely should eyebrow hair be darker than a client’s natural hair. Even if a blond has dramatically lightened her hair, the natural hair color will be a deeper, ash or golden blond color and that color eyebrow will appear most natural. Likewise, a red head will rarely have a bright red eyebrow. Look at the eyebrows on a naturally auburn haired child and you will see a reddened softened brown or blonde brow, rarely a bright red tone. A brunette should apply the tone of brown or black closest to his or her natural hair color but a slight shade lighter and then layer the strokes of the hairs to increase density for a more natural look, never appearing hard. On most people, the Universal Brow Definer® and Perfect Brow Gel® will provide the most natural eyebrow appearance possible. Sometimes, I will variegate in a distinct color like an auburn red, or deep black very, very sparingly to enhance the tone of the Universal Brow Definer® application, but this is the exception and not the rule. As far as shaping is concerned, the most general guidance I can suggest is that the brow should begin above the inner tear duct and arch above the outer iris, then gently taper outward at about a 15-20 degree downward angle to about 1/4 to 1/2 inch outside the outer eye including the eyelash extension length. Be careful not to dip down on the edges of the eyebrow causing a semi-circular clown like appearance. Don’t use the nose as a guide, because nose widths vary both between the eyes and at the nostrils, so to use the nose can throw the entire eyebrow shaping out of proper alignment with the eye. An important tool is a good magnification mirror, but a full-sized mirror should be used to check shaping during the process so that the overall appearance is natural. As far as the density and width of the brow are concerned, that is where the amount of eyelid above the eye comes into play, as well as the overall facial bone structure, whether it is small, medium, or large. This is where artistry comes into play. My best advice is to consult a professional makeup artist with a specialty in eyebrow design and enjoy a professional design that you can maintain on your own. Personally, one of my greatest joys is a private eyebrow consultation. My fee is $125.00 per client and includes a take-home brow kit to continue the look, a very worthwhile investment in your personal style. Interview with Brenda Christian, President and CEO, Brenda Christian Cosmetics, Inc.
Brenda Christian founded her eponymous cosmetics line in 1982 to offer women unparalleled solutions to their skin care and makeup needs. The company develops products based upon voids in the cosmetics industry that Christian identifies through client interactions. We talked to this inspiring female entrepreneur about her journey, creating her own line of products and much more! Great brows are the first step to gorgeous eye makeup. When properly groomed and filled-in, they lift the eye and make you look years younger. To discover your ideal brow shape, lay a pencil next to your nostril reaching up to your brows. Brows should start at the spot where the pencil hits. Then angle the pencil to the outer corner of your eye to see where your brows should end. It is crucial to get your brows shaped by someone skilled. After having them done professionally, you can tweeze new hairs as they come in. Tweezing is most precise, but I recommend at least some waxing, to remove the ﬁne blonde hairs under the brow. Cleaning these up brightens the eye and helps shadow go on smoother. Many people’s brows are too thin and/or short. When thin was in, in the 60s and again in the 90s, women over-tweezed, and now their brows won’t fully grow back. You want them look thicker yet still natural. Many women use a pencil that’s too dark. A taupe pencil works on everyone. Brenda Christian’s Universal Brow Definer is a great choice! Follow this with her Perfect Brow Gel to hold everything in place. You may be attached to your full brows, but if they are too full they can look heavy and weigh the eye down. It is important to give brows proper shape and balance for your face. Many women don’t know how to do eye makeup. Either they wear hardly any for fear of doing it wrong, or they put on the wrong colors conﬁdently, thinking it looks good. The biggest offense is sparkly, frosty shadow- it makes eyelids look wrinkled. Also, avoid cream shadow – it looks oily on the lids. Apply a base/primer on the lid to cover undertone colors and brighten the eye. I use my Camoﬂauge Eye Disguise Concealer (part of my Beauty Ammo Kit). Apply base eyeshadow. Choose a base color that isn’t too light (think 60s dated light pink) or too dark. It should be close to your skin tone. A pinky-peachy-sunset color is universally flattering. Apply it to entire lid with a fat shadow brush that you use only for base shadow. If you apply other colors with that brush, the next time you apply base shadow the other colors will still be on the brush and the base color won’t go on properly. Apply a crease color to the outer 1/3 of the eye and across the whole crease. Most women apply crease shadow too low, which ends up “closing” the eye. Using an angled shadow brush, sweep it up onto the brow bone, and blend it well after. My favorite crease shadow color is a caramel-light-mocha, more bronze than brown with a hint of peach. It looks great with any clothing, eye color and doesn’t distract from features. Stay away from purple, green and plain brown for crease colors. Most purples make your eyes look red, greens can look dated and browns are just dull. Navy works as liner. Line upper and lower eye with a pencil, then go over it to set it with a dark navy shadow. Use navy with some shimmer for nighttime, but only as liner applied with a stiff tiny angle brush. For night, most women look best in the same shadows they use for daytime, but applied with a heavier hand and always well-blended. 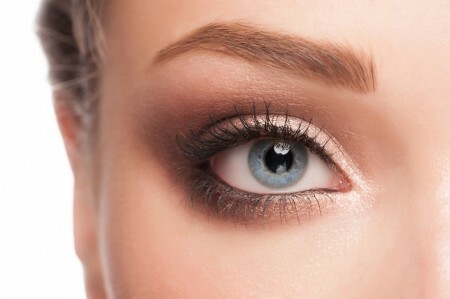 For a smoky eye, apply navy to the outer third and around the crease, then add black liner in pencil shadow or liquid. Because pencil liner can be oily, it is important to go back over it with shadow to set it and give more staying power. One of the best selling mascaras (not naming names!) is one of the worst looking on. I can always spot it on someone – their lashes look like frog legs! It is stiff, clumpy and requires several coats. I also dislike waterproof mascara as it is so hard to remove and so harsh on lashes. Use mascara that stays soft on your lashes. Always do a couple coats, and apply a lash conditioner/thickener underneath to make lashes look fuller, yet soft and conditioned.